BMW Certified, CARFAX 1-Owner, LOW MILES - 15,143! Heated Seats, Moonroof, iPod/MP3 Input, Power Liftgate, Back-Up Camera, Dual Zone A/C, Smart Device Integration, CD Player, Onboard Communications System, PARK DISTANCE CONTROL AND MORE! KEY FEATURES INCLUDE Power Liftgate, Back-Up Camera, Turbocharged, iPod/MP3 Input, CD Player, Onboard Communications System, Aluminum Wheels, Dual Zone A/C, Smart Device Integration Rear Spoiler, MP3 Player, Privacy Glass, Steering Wheel Controls, Child Safety Locks. OPTION PACKAGES CONVENIENCE PACKAGE Universal Garage-Door Opener, Auto-Dimming Interior Driver Exterior Mirrors, Auto-Dimming Rearview Mirror, Power-Folding Mirrors, Panoramic Moonroof, SiriusXM Satellite Radio, 1 year All Access subscription, Ambient Lighting, Comfort Access Keyless Entry, Lumbar Support, PARK DISTANCE CONTROL Parking Assistant, HEATED FRONT SEATS STEERING WHEEL Heated Front Seats, Heated Steering Wheel, FINE-WOOD 'FINELINE' TRIM W/PEARL CHROME ACCENT, TRANSMISSION: STEPTRONIC AUTOMATIC sport and manual shift modes and Adaptive Transmission Control (ATC) (STD). 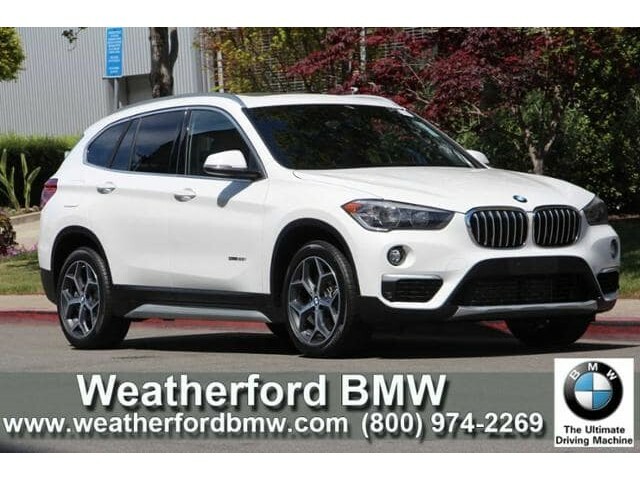 BMW sDrive28i with Alpine White exterior and Black SensaTec interior features a 4 Cylinder Engine with 228 HP at 5000 RPM*. BUY WITH CONFIDENCE Unlimited Miles for 1-Year plus the balance of original new vehicle warranty (4-Year/50,000-Miles), 24-Hour BMW Roadside Assistance, Comprehensive Inspection and Reconditioning, Trip-Interruption Services, Trip-Planning Services WHO WE ARE Weatherford BMW of Berkeley is dedicated to providing you with an ownership experience worth raving to your friends about. We offer a brand new facility with over 400 cars to choose from and 200 cars to view Indoors! Horsepower calculations based on trim engine configuration. Fuel economy calculations based on original manufacturer data for trim engine configuration. Please confirm the accuracy of the included equipment by calling us prior to purchase.